Kent’s Ethan Akanni from Bexley became a National Sportshall Champion when he won the U/15 boys Standing Triple Jump at the National Sportshall Final in Sports City Manchester last Sunday (6 April 2014), he jumped a PB of 8.75m; it is also a County Record. Ethan also claimed a Bronze medal in the Shot Putt with 12.33m. He finished 4th in the all-Rounder competition, this was out of 66 competitors. Well done Ethan. At the Regional Sportshall Final at Burgess Hill Kent, although having no winning teams won a total of 13 medals across the age groups. Grace Sullivan from Ashford won two medals in the U/15 all-rounder competition. She won Silver in the Standing Long Jump with a jump of 2.34m and a Bronze in the 2 Lap Race 25.0s. This won her the all-rounder competition tying with another Athlete from Hampshire giving her the opportunity to go to the National Final in Manchester, unfortunately Grace is on a school trip so is unable to take up the offer. Jaimee- Ann Hayes (Ashford) was the other medal winner taking Gold in the Speedbounce with 88 bounces. Hannah Owen (Ashford)just missed out on a medal in the Shot Putt coming 4th with 9.16m. Rebecca Hawkins (Ashford), Alexandra Pickett (Ashford ) and Natasha Scott ( Medway& Maidstone ) made up the rest of the team. The team finished 6th . The U/15 boys won 4 medals with Ethan Akanni (Bexley) won the gold medal in the Standing Triple Jump with 8.38m. Ethan would have been in line perhaps for the all-rounder winner but unfortunately he had 3 no putts in the Shot Putt. Moses Aregbesola won Silver in the 2 Lap Race (22.7s). Moses came 5th in the All-rounder just 2 points behind the 3rd place. Oliver Hussey (Dartford) won the Shot with 12.58m. Oliver Marsh (Ashford), Marcus Simmons (Swale) and Aaron Cooper (Swanley) made up the team. The team finished 4th. In the U/13 age group Erin Moses (Thanet) won a Gold Medal in the Speed Bounce 81 bounces. Faith Cox (Ashford) claimed Silver in the 2 Lap race. She ran (25.2s) in the heats and (25.7s) in the final. Ella Hindle (Ashford) bounced her way to a Bronze Medal in the Speed Bounce with 79 bounces. Jade Curtis just missed out on a Bronze medal fishing 4th in the Standing Triple Jump with 6.50m. Yetunde Mongo made the final of the 2 lap race finishing 5th in (25.8s). It was a very close race if you compare Faith’s time of (25.7s) to claim 2nd. Lauren Macey (Invicta) Frinee Akuma (Bexley) Faith Etokowo (Ashford) Hannah Brooks (Ashford) Sola Sowole (Ashford) Alice McLennan (Ashford)and Ashley Ward (Ashford) made up the rest of the U/13 girls team. The team finished 7th. The U/13 boys won 3 medals. Jason Okushnya (Bexley) qualified for the 2 Lap final having run (24.1s) in the heats, his run of (23.9s) put him in 4th place. Jason made up for this by finishing 2nd in the Standing Triple Jump with 7.82m. Thomas Keaveney (Ashford) won Silver in the Speed Bounce 78 bounces. Jack Smith (Bexley) also won a Silver Medal in the Standing Long Jump 2.38m. Connor Neal (Thanet) came 6th in the Standing Triple Jump 6.65m. James O’Gorman (Paddock Wood) was 5th in the Shot Putt 9.57m. James Hussey (Dartford) came 6th in the same event 9.45m. Harry Pitman jumped 55cm in the Vertical Jump to claim 5th place. Jack Seery (Thanet), Reece Williams (Folkestone) and Morgan West made up the rest of the team. The team came 5th overall. ETHAN AKANNI from Bexley has been invited to compete in Manchester in the U/15 all-rounders competition for his outstanding performance in the Standing Triple Jump, on Sunday the 6th April. Our best wishes go with him in his attempt to become a National Champion. Due to the fact that Sportshall had no sponsor this year, the county has supplied medals for the winning athletes. Our Thanks go to all who took part in the Regional Final and Tina Tappenden, Charlotte and Kyle who came to officiate with Mick Duffin and Brian Charlton. The first Sportshall competitions for next season are already booked. Sunday October the 5th at Tunbridge Wells, Sunday 9th November at Folkestone and the County Championship is on Sunday 7th December at Ashford. 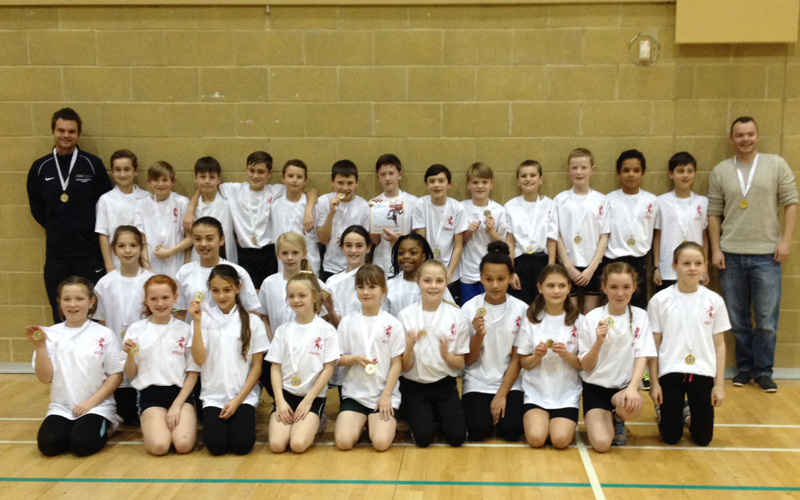 The Kent U11 Sportshall athletics teams travelled to Burgess Hill in Sussex on Sunday 12th January to compete in the Fun in Athletics South East Regional Festival against 8 other counties from across the South East region. The boys and girls teams both produced an outstanding series of performances to be crowned champions in both competitions. The competition got underway with the obstacle relays and the Kent teams started the afternoon as they finished in a winning position with both teams winning. In the girls competition the team recorded 6 overall event wins in the Obstacle Relay, over and Under Relay, High Stepper, Speed Bounce, Standing Triple Jump and Vertical Jump. The following athletes won their individual events Grace Pitman and Yasmin Sadler-Reeves in the Balance Test and Kizzy Gape in the Standing Triple Jump. The girl’s team finished 18 points clear of Buckinghamshire who finished runners up and 36 points clear of Berkshire who finished in third place. The boy’s team notched up 8 overall team victories in the Obstacle Relay, Hurdles Relay, Grand Prix, High Stepper, Balance Test, Speed Bounce, Standing Triple Jump and Target Throw. Five athletes won their individual events Max Merrien in the Speed Bounce, Louis Hillier and Toby Yemm in the Balance Test, Aston Fredericks Standing Long Jump and Tom Wills Target Throw. 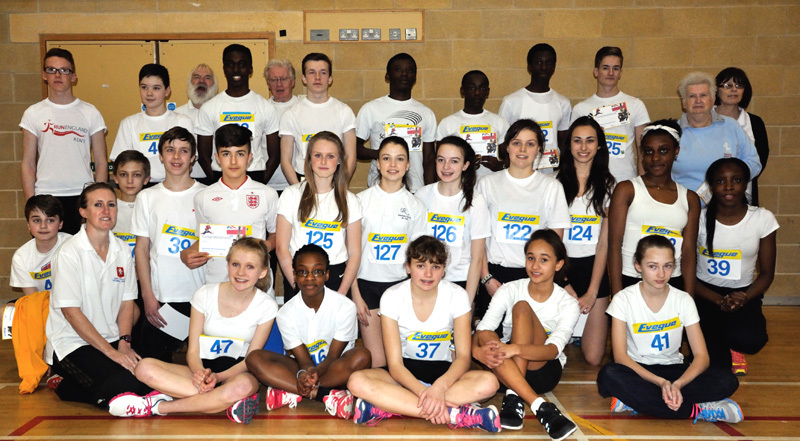 The Kent teams where managed by Ashford Leisure Trust on behalf of the Kent County Athletic Association and where selected following their performances in the Kent U11 Sportshall Athletics Decathlon and the KCAA Sportshall Athletics Championships both held at the Stour Centre during December.